My son and I traveled down to Silver Falls State Park this past weekend with family friends to check out their Christmas Festival. It was awful. Do not go. Ok, I lie. I only say this because I want to keep this little gem of a festival a secret! It was pretty wonderful actually. They had tons of crafts and goodies for the kids, live music, and one of the most amazing Santa Claus. He had the genuine twinkle in his eye as he sat with the kids and took their holiday wishes. 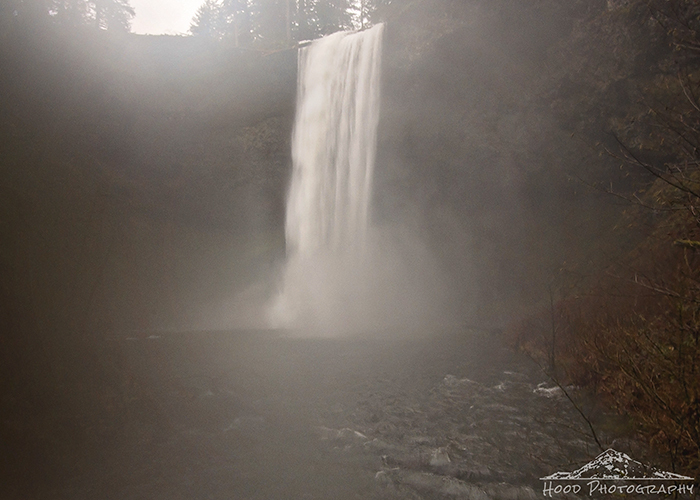 We also did the hike down to the bottom of the raging South Falls. The clouds and fog was so thick when we made it down there! This is the very misty view from the footbridge that crosses Silver Creek, which was so swollen it was like a river! Glad your son enjoyed the Christmas festival. I like coming to Silver Falls SP in the fall when the colors are turning. It's fantastic! Beautiful photo! Great recommendation...looks like we might be heading up to Oregon to live next year so I might get to see that Christmas festival myself! Beautiful shot. Love all that water mist! !